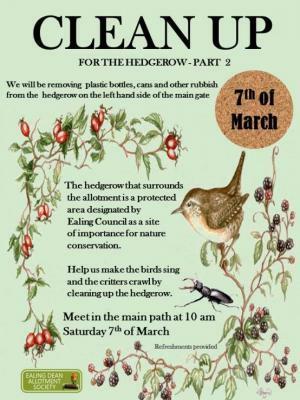 Home » Volunteer Day Saturday March 7th - Come and join us! Submitted by Mardien Drew on Thu, 26 Feb 2015 - 22:12. Removing the litter is the start of the hedgerow restoration. • Lay the hedge in certain areas - to ensure a denser hedge to make it a more efficient barrier and wildlife haven for birds and hibernating creatures. If you would like to volunteer have a look at the image below for details. It's a good way to meet other people and there will be tea, coffee and cake! We'll stop mid-morning for tea and cake. We'll probably wrap things up around 13.00. But if you are keen and eager you're very welcome to stay - there are always plenty of jobs that need doing. We do have tools...forks, secateurs and wheelbarrows - plus gardening gloves. However, if you have your own fork or secateurs feel free to bring them along - just in case we run out. Please note - we highly recommend you wear long trousers to protect your legs against nettles, thistles and brambles. Please wear sensible shoes for gardening, getting muddy and to protect your feet. Paths are uneven and can be slippery when wet. If it has been raining - wear waterproof shoes/boots or your feet will get soaked. If you have any questions do contact us by email. 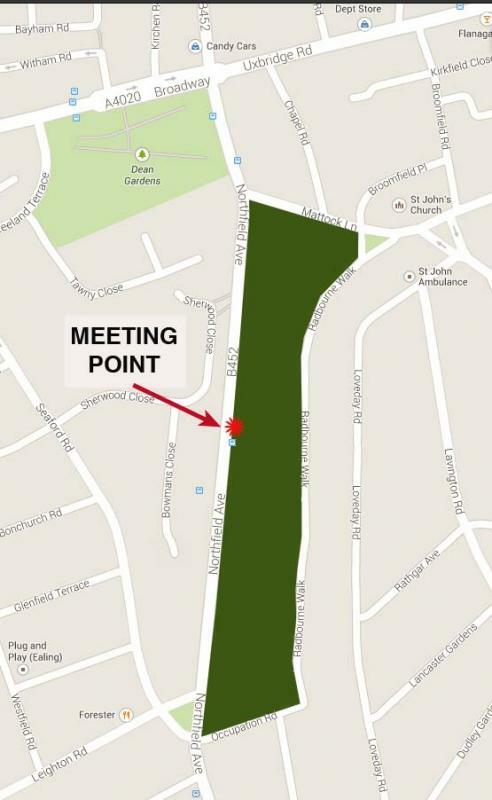 We look forward to meeting you on Saturday 7th March at 10.00 at the big double gates on Northfield Ave (map below). I do hope you'll come along and meet the rest of the volunteers. We’re a friendly bunch. Thanks and looking forward to seeing some of you there!